NEW YORK (AP) — After saying goodbye on concert stages and online video streams, Lil Wayne had nothing to add as he was sentenced Monday to a year in jail for having a loaded gun on his tour bus. The Grammy Award-winning rapper delivered only a brief bow to fans and supporters as he was led out of a courtroom in handcuffs to start serving his sentence. With that, Lil Wayne headed off to face his punishment in a case that had shadowed him as he became one of music's most prolific and profitable figures in recent years. Arrested in July 2007, he pleaded guilty in October to attempted criminal possession of a weapon. He admitted he had the loaded .40-caliber semiautomatic gun on his bus. His lawyer, Stacey Richman, said the rapper was resolute as he was taken away. "He knew what he had to do, and he's doing it," she said. Lil Wayne arrived later Tuesday at the Rikers Island jail complex, where he was being held apart from the general population of inmates because of his fame. He has a cell to himself but the option of spending time in a TV room with 17 other inmates who also have been separated from the general population because of notoriety or other reasons, according to the city Correction Department. It wasn't immediately clear what work assignment he might have, if any. The 27-year-old rap star could be released in about eight months with good behavior. Lil Wayne, born Dwayne Carter, is going behind bars with his career in full throttle. His "Tha Carter III" was the best-selling album of 2008 and won a Grammy for best rap album. His latest album, "Rebirth," was released last month. He made a point of leaving fans with fanfare, from a "farewell tour" in recent months to a series of videos on the Web site Ustream on Sunday. "Law is mind without reason ... I'll return," he wrote on his Twitter account Monday morning. Dozens of fans jockeyed with photographers waiting on the courthouse steps Monday afternoon, cheering as Lil Wayne, fellow rapper Birdman and others arrived. Shouts of "Oh, man" and "Keep your head up, Weezy!" — a nickname he often uses — erupted in the courtroom as he was sentenced. 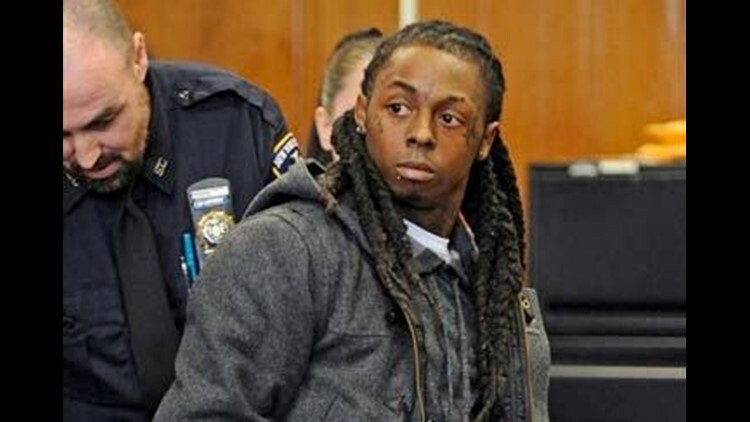 Although Lil Wayne had agreed to go to jail, a number of roadblocks kept him from starting his sentence in recent weeks. First, his sentencing was postponed in February so he could undergo surgery on his bejeweled teeth. Then, a fire shut down Manhattan's main criminal courthouse while he was on his way there last week. As for listening to music, inmates are allowed to buy AM/FM radios at the jail commissary.